U.S. Bujutsu Kai is a Martial Arts School offering Mixed Martial Arts (MMA), Judo, Aikijujutsu & Kenpo. classes in Auburn, WA for kids, men and women. 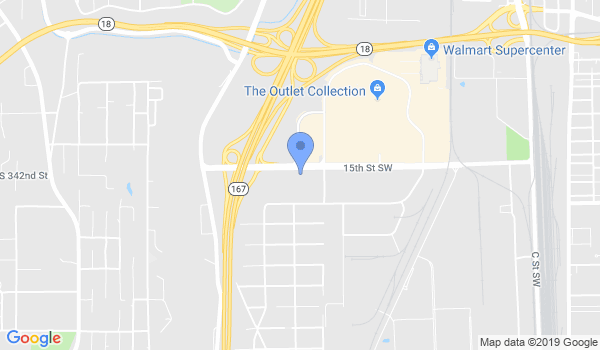 U.S. Bujutsu Kai is Located at 1604 15th SW.
View a Location Map, get Directions, Contact U.S. Bujutsu Kai or view program details below. If you are a student at this school, help your local Martial Arts Community by writing a Review of U.S. Bujutsu Kai. You can also help your school by sharing it on Facebook, Twitter, Google+, Pinterest etc. This is for appointments only. No walk ins please. These are private individual and small group settings for martial art lessons two times a week. Email or text for lessons. Minimum age requirement is 16 years of age plus. Street self defense with elements of Judo, Aikijujutsu and some Kenpo. Would you like more information on hours, classes and programs available at U.S. Bujutsu Kai? Please contact the school with your questions. Update the details, Write a Review or Report Error of U.S. Bujutsu Kai. View all Dojo in Auburn or in Zip code 98001. This Chart shows the Martial Arts Styles offered most in Auburn, Washington area. View a list of Dojo in Auburn, or enter your address below to find schools closest to you.